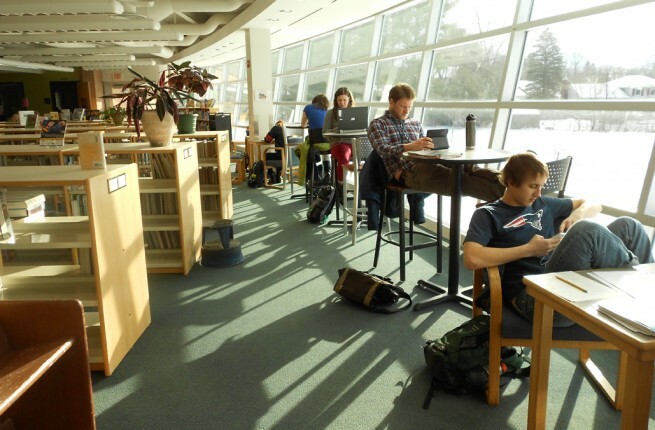 The University of Vermont offers graduate educational opportunities for those interested in school library media studies to gain licensure in Vermont, or to acquire a graduate degree in school library media. School Library Media Specialists are educational leaders and resource specialists in pre-K schools who collaborate with other educators to provide equitable access to resources and information for all students. The School Library Media Sequence reflects current standards for school librarianship as described by the American Association for School Librarians (AASL), the National Board for Professional Teaching Standards (NBPTS), and Vermont Standards for Educators. The School Library Media Studies Sequence of six graduate-level courses is designed for both those with and without teacher certification. Non-educators may need additional coursework. The curriculum addresses the essential competencies for School Library Media Specialists required by the State of Vermont, as listed within the Educator Licensing website, but licensure is not automatic. Courses in the sequence are delivered using a combination of face to face classroom meetings, online work, and online synchronous sessions during the semester. For most educators, who are already certified, the basic courses in the series will provide competencies leading to licensure in the State of Vermont. For those not currently certified as educators, additional competencies will be required. All participants are encouraged to contact the Vermont Agency of Education Licensing Office for a preliminary conversation about requirements for licensure based on individual circumstances. All the courses in the sequence are upper level/graduate courses and are embedded in a strand of the UVM Master of Education Program in Curriculum and Instruction. For those who may want to pursue an advanced degree, the courses can be combined with other education courses that will lead to the MEd. Contact the College of Education and Social Services for more information. This series of courses (online and on campus) allows you to gain licensure as school library media specialist. Content of the coursework addresses the essential competencies required by the State of Vermont. Upon completion of the two-year series, qualified individuals may request a transcript review by the Vermont Agency of Education. While the sequence originated with practicing educators in mind, it is by no means aimed exclusively at teachers. For those who need to gain particular competencies, individual courses may be taken. For licensed school library media specialists, courses in the sequence may serve as an important resource for professional development or recertification credits. To learn more or register for Library Media courses, please visit the UVM Continuing and Distance Education web page. Have you been in a school library lately? If not, it’s time for a visit to your local school to see a learning space that is the hub of social and intellectual activity. Think Starbucks with resources and technology, and an atmosphere that encourages inquiry, exploration of ideas, and self-expression.